It was soooooo hot today. Someone told me it was 33 degrees celsius. 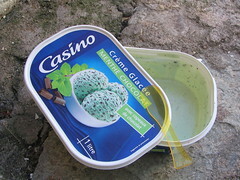 When I arrived in Bonifacio, I had to cool down so I ate a whole litre of ice cream. I am at the southernmost point of the island and will probably stay here for another day so I can see the city, and then I plan to take the ferry to Sardinia. Heather this site is real nice, I’m glad you are documenting this stuff so that I can see it all. Go for the gold! …so is the junkfood over there good or not???? glad your leg is okay. watch that ice cream doesn’t come pouring out of there. When i toured i dont think i did the ice cream, that must have been a time when i didnt like it. but now i’m up to a pint a day.